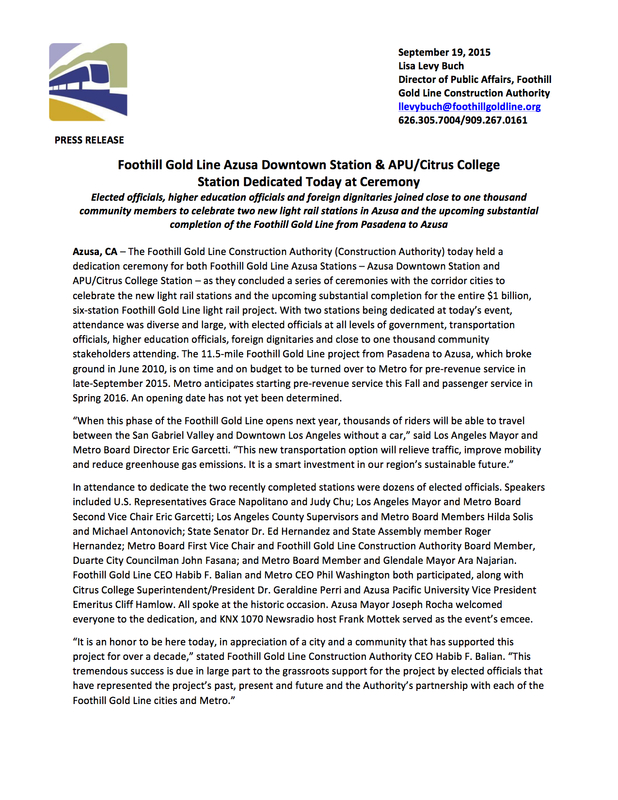 With construction almost complete on the Gold Line Foothill Extension, the independent agency building the project has begun holding dedication ceremonies for each of the six stations. The dedication for the two Azusa stations was held on Saturday and, as expected, attracted another big crowd — as did the previous four station ceremonies held over the past month. (More photos here). 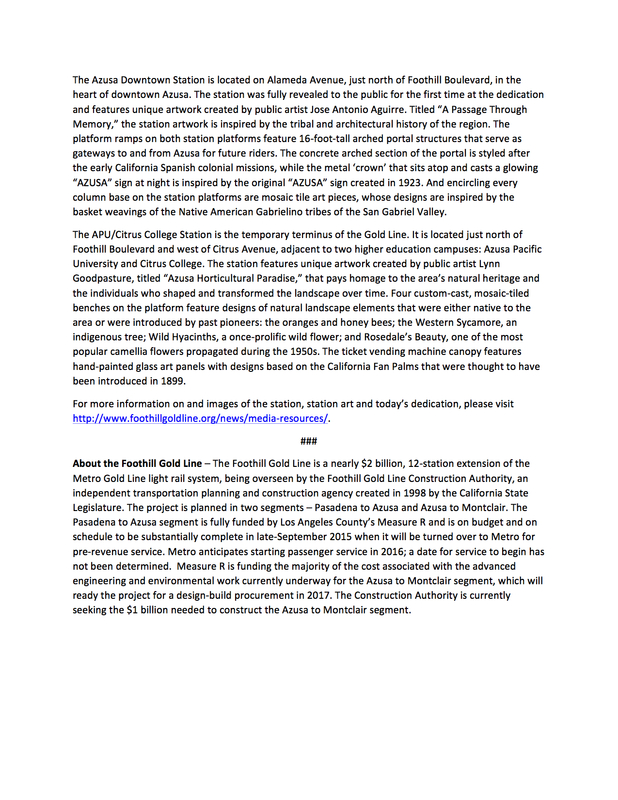 Below is the program and the press release from the Gold Line Foothill Extension Construction Authority, as well as a video about the making of the art for the stations — one in downtown Azusa and the other adjacent to Azusa Pacific University, Citrus College and the Rosedale development. The Authority will soon wrap up construction and begin the process of turning over the project to Metro this fall. Metro will then begin pre-revenue testing and employee training with an opening of the 11.5-mile Gold Line extension in 2016. Before you ask: we don’t have an exact date yet! The project is mostly funded by Measure R, the half-cent sales tax approved by Los Angeles County voters in 2008. Why does Azusa need two stations? The children can take the bus from downtown. Why should the train stop a couple miles short of _two_ colleges? The Citrus/APU Station should be the busiest station in the extension. Because the APU/Citrus station is actually on the border with Glendora. Clever planning gets you extra support and votes. Please do feel free to comment upon the design issues pertaining to the center platform versus the side platform configurations for the downtown Azusa and the APU/Citrus College stations, respectively. I need to be enlightened! I don’t have any small or big feelings about this issue. All things being equal, I suppose that I prefer separate platforms because they provide more overall space for people. When does it reach Cucamonga? Unknown. The next phase to Claremont is in Metro’s long-range plan but is currently not funded. Cucamonga is in San Bernardino County and that county would have to decide whether to build that project. Metro’s domain is L.A. County. Also, similar question regarding the Monrovia station? I am referring to the requirement that Metro keep a 30-foot separation between the Gold Line tracks and the adjacent BNSF freight track. There is no bridge. The platforms can be entered from the street. You can see the configuration on Google Maps. I’d reckon that, overall, two platforms would be more expensive to construct than one?